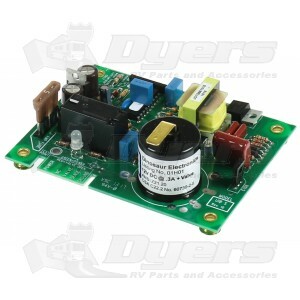 This universal Model UIB-S works in any furnace, refrigerator or water heater that uses a standard ignitor board. Coleman, Duo-Therm, Hydro-Flame, Suburban Furnaces. Atwood, Mor-Flo, Suburban Water Heaters. 3-1/4" x 4-1/4" x 5/8"
Good solution to failed component , easy install , can be repaired ! Good solution to mechanicly broken Atwood unit . EASY to install . It CAN be repaired !!! Good job , will stand test of time in Arizona . A quick and easy replacement for a failed water heater ignitor. The replacement board arrived promptly and worked find. Thasnks for providing a quality product and great service.